Their menu actually had more than just crepes, including a very intriguing lamb dog that I ultimately decided to save for my next trip. But I'll have to admit I was a little taken aback by the prices. My first choice for ordering would have been the Crepe Gamin which was your choice of 3 of the following: leek, goat cheese, chicken, mushroom, ham and cheese. Yum. Oh, the combinations I could come up with! But at $9, Lawman very quickly nixed my Crepe Gamin dreams. We were both hungry for something savory though so we settled for the ham and cheese crepe, which for $7 wasn't what you would call a bargain. It was good, but I don't know that I would say it was $7 good. 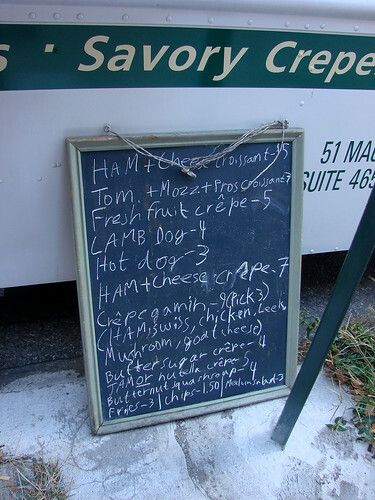 I've never been to any of Le Gamin's storefront locations but browsing on menupages it appears that the ham and cheese crepe at the their SoHo location is $7.50 and that comes with organic mesclun. On a real plate. Served inside a restaurant. The Crepe Gamin at the restaurant was also $9, but again came with organic mesclun and you had different choices of filling that included: cheese, ham, egg, chicken, sausage, ratatouille(! ), and mushrooms. 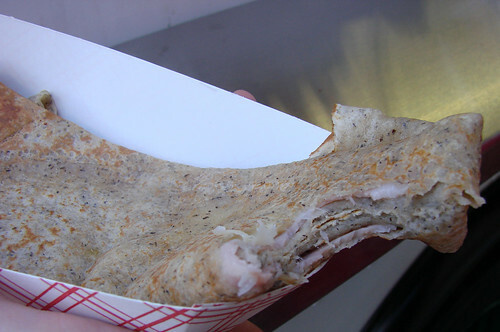 Some of the crepes were actually more expensive on the truck. 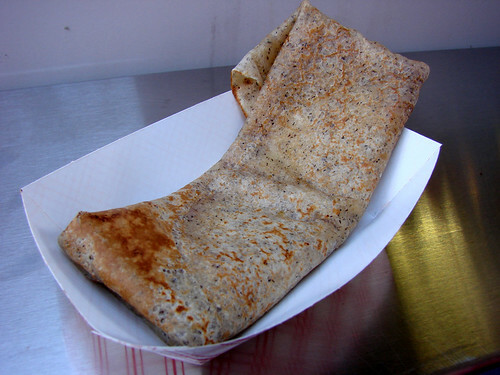 The butter and sugar crepe was $3.75 in the restaurant and $4 on the truck. The crepe with jam was $4.25 in the restaurant and $5 on the truck. But for some reason the fresh fruit crepe was $5 on the truck and $6 at the restaurant. Now to me this seems like how it should work...food should be cheaper coming from a truck since you have less overhead. What do you think? Any Le Gamin reports? Either from the truck or the actual restaurant? How do their crepes stack up? If I'm looking for a quick snack I might give their fruit or jam crepes a try, but if I'm really hungry, I'd rather pay a couple extra bucks and get brunch at the nearby restaurant, Cheryl's Global Soul where $10-$13 gets you brunch with coffee and a mimosa or bloody mary. 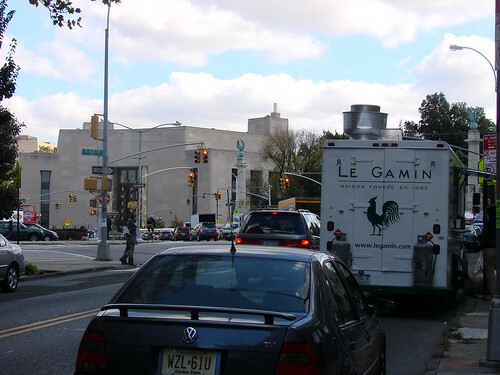 If you're up for crepes while doing your green market shopping the Le Gamin truck should be at Grand Army Plaza from 9:00ish am today. If you head over at around 10:30 you can catch Treats Truck on the same block! 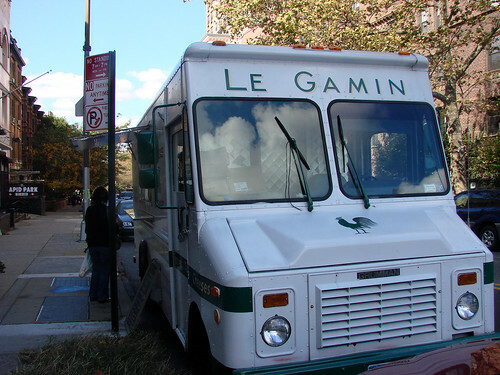 I will always have a soft spot in my heart for Le Gamin, seeing as I've spent many hours in their 5th St location. I can only hope they reopen after the Shutter.